Fu zhì jiang you 複製醬油 loosely translated as replicated soy sauce. Another common name you may come across is red soy sauce 红酱油 for tian sui mian 甜水麵. 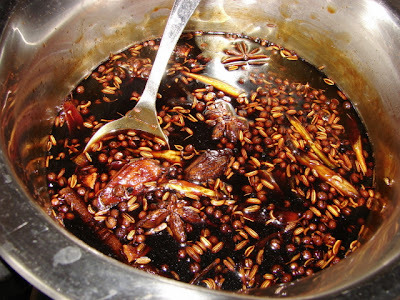 This is an aromatic sugar and spice infused/reduced soy sauce for many Sichuanese dishes especially for snack xiaochi 小吃 and salad 凉菜 including noodles. Put everything together in a saucepan, gently simmer for about 40 - 50 min till fragrant and slightly thickened. Cool and strain. Store in clean bottle or jar. Can keep at room temperature or in the fridge. Lasts longer in the fridge for freshness.